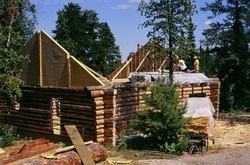 Bjorn is building a log cabin a few kilometres from our house. It is in a beautiful location overlooking the lake and a rapids. At this stage, the work today is to put up the purlins and the ridge pole. Dad and I came to help. Bjorn didn't feel like waiting to get all the proper equipment, so the whole thing was a little dangerous. This is the cabin at the start of the day. This shot is of the first purlin being put up. Bjorn has prepared the log prior to raising it, with all the proper notching and cuts. 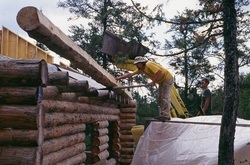 Bjorn is using the backhoe bucket to raise the log high enough to slide up the gable ends. Dad is positioning the log as it tends to want to swing. Bjorn and Dad are putting in the last purlin. 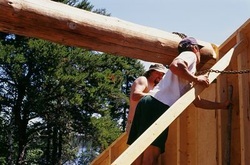 The ridge pole is the top horizontal log and rests on the king posts which are the vertical logs in the middle of the gable end. 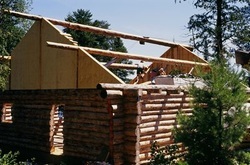 The purlins are the two horizontal logs on either side of the ridge pole and are resting on the queen posts. If you look closely, you can see small 2 by 4's that are in between the purlin and ridge pole on the gable end closest to the camera. Bjorn used these as steps to push the ridge pole up by sliding it along the gable end with brute force. That is why Dad calls him 'danger man'. It may look like nothing but the log is very heavy and there is quite a drop-off with nothing to stop Bjorn from falling off. It was a great relief to be finished this part!